This pork chop meal was absolutely delightful! Not only was it incredibly easy to make (in less than an hour! ), but it was so perfect for a gorgeous summer evening. I’m not a big fan of cucumbers (I think I’m cucumber-traumatized from our huge juicing fail) or radishes, but the lime juice in the salad gave them that special zest that made me enjoy them. I ate a bite of salad with each bite of pork chop and the cool citrus salad offset the spicy pork perfectly. 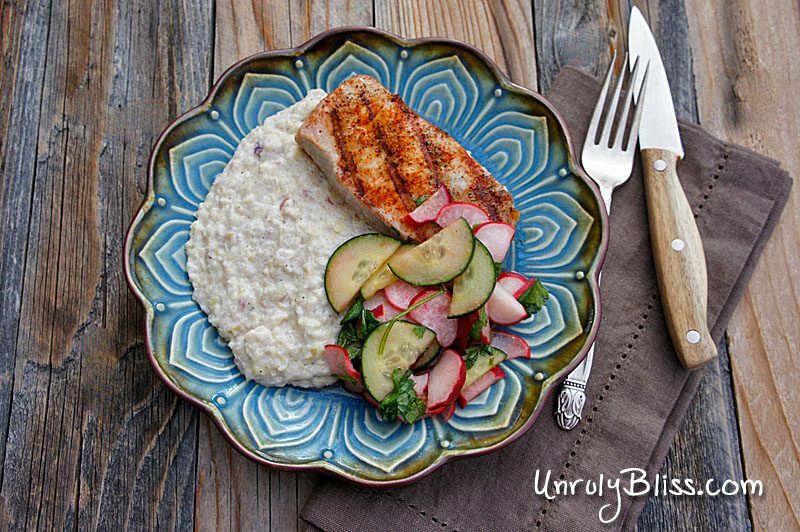 I very highly recommend this delicious meal for a weeknight dinner! 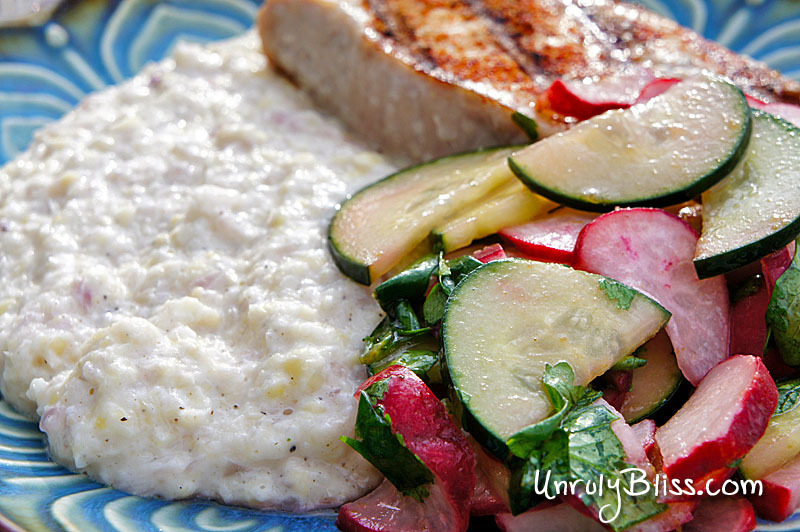 Combine the radishes, cucumbers, cilantro, lime zest and lime juice, 1 tablespoon of the oil, and ¼ teaspoon each salt and black pepper in a medium bowl. Heat 1 tablespoon of the remaining oil in a medium skillet over medium heat. Add the onion and ¼ teaspoon each salt and black pepper and cook, stirring occasionally, until softened, 6 to 8 minutes. Add the corn and cook, stirring occasionally, until tender, 2 to 4 minutes. Transfer to a food processor. Add the sour cream, Cotija, 3 tablespoons water, and ¼ teaspoon each salt and black pepper; process until almost smooth. Heat the remaining tablespoon of oil in a large skillet over medium heat. Season the pork with the cayenne and ¼ teaspoon each salt and black pepper. Cook until well browned and an instant-read thermometer inserted into the center of each chop registers 145° F, 6 to 8 minutes per side. 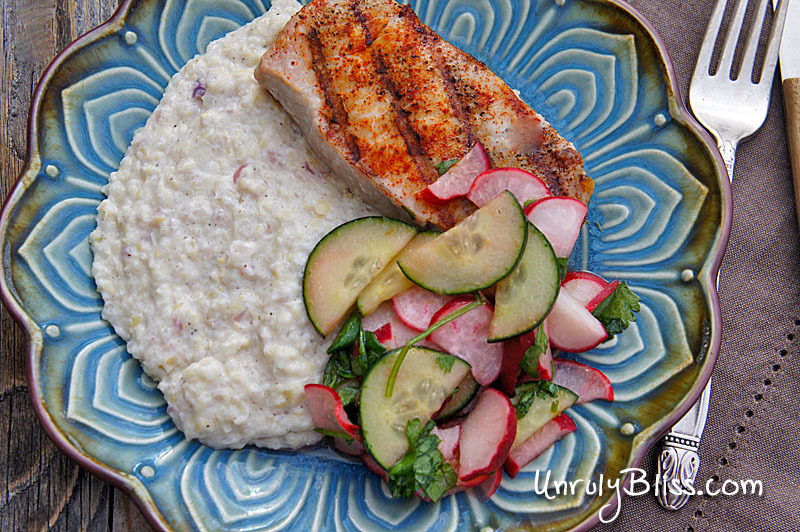 Serve the pork with the corn puree and radish salad.